A celebration and souvenir of Helicon’s decades-long tradition of annual Winter Solstice Concerts in their hometown of Baltimore, this CD combines familiar (and not so familiar) Christmas carols with Helicon’s typically wide-ranging world-folk excursions, this time including tunes from China, Russia, Ukraine, Mexico, Israel, Denmark, South America and beyond. Not your typical Christmas album – which might be why it won the Association for Independent Music’s prestigious INDIE Award for Seasonal Recording of the Year. The Baltimore-based trio Helicon (Chris Norman, Ken Kolodner, Robin Bullock) toured widely throughout North America and Europe from 1985 through 1998. Helicon ceased touring in 1998 to pursue other opportunities, but before they did, they recorded this CD at Troy Savings Bank Music Hall in Troy, NY. The members of Helicon are widely recognized as among the finest practitioners of their respective instruments. The repertoire for this recording was collected over the first thirteen years of Helicon’s annual Winter Solstice Concert. The concerts presented seasonal music from around the world, traditional Christmas favorites, and Helicon’s own unique blend of international traditional dance music. This is not your typical seasonal recording but it is widely loved by all those who hear it. The first of these annual concerts in 1986 featured a double bill with Metamora (Malcolm Dalglish, Grey Larsen and Pete Sutherland. NPR was on hand for several national re-broadcasts of the show. Helicon began this tradition by inviting various guests including a return of Metamora, Doc Watson (with NPR once again), John McCutcheon, Alison Krauss, members of the Paul Winter Consort, Hesperus, Patrick Ball, Jay Unger and Molly Mason, Laura Risk, Freyda Epstein and others. Ken, Chris and Robin now look forward to these magical annual concerts as a fabulous reunion. In recent years, Ken’s son Brad (banjo, fiddle, vocals) and Chris’s daughter Marlys (modern dance) have joined the fun along with stepdancer Jonathan Srour, National Scottish Fiddle Champion Elke Baker and bassist Alex Laquement. 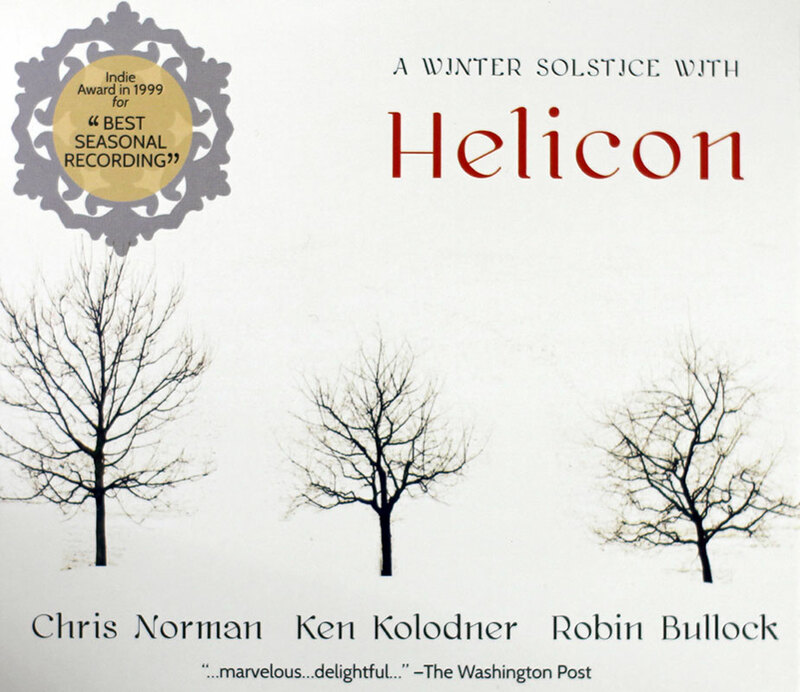 In December 2013 Helicon celebrated its 28th Annual Winter Solstice Concert at Goucher College in Baltimore. Together, the members of Helicon continue to work their magic year after year.